I remember when I used to comb through new and used art bookstores looking for anything I could find on 19th century painters or Golden Age illustrators. 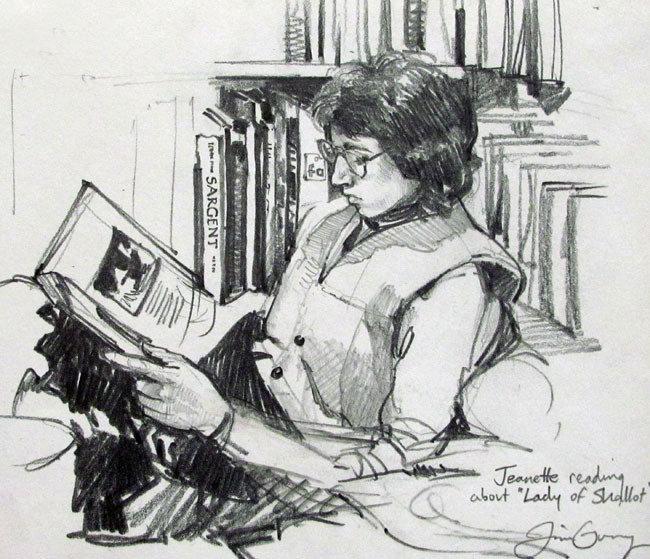 Here's a sketch from about 1985 of my wife Jeanette reading to me from a book on John William Waterhouse. Before computers and the internet, finding a good art book was like uncovering a vein of gold. In those days, you couldn't find much on Bouguereau, Meissonier, Gerome, or Waterhouse. Sargent was just beginning to come into the light. 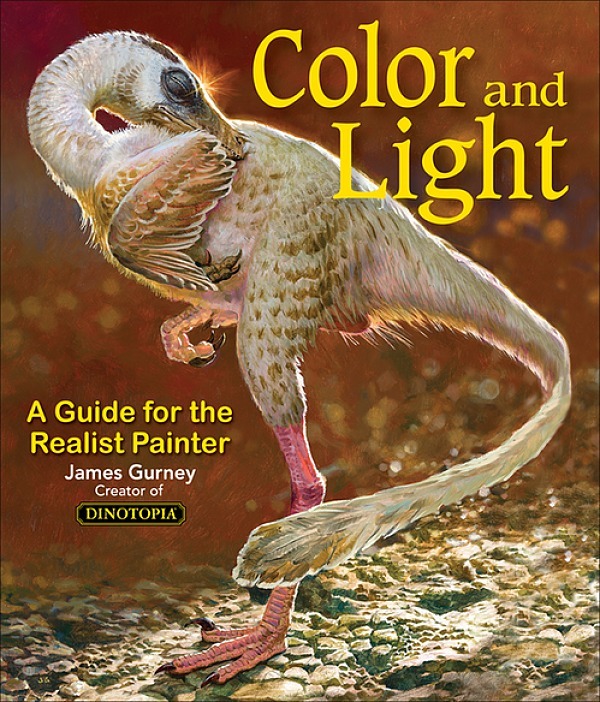 It seemed worth spending $50 for a book, even if it had only two or three good color reproductions. I would stick yellow tags on the best pages, with the name of the artist written in small letters so I could find them again. The casual availability of images now is both a blessing and a curse. It makes me treasure each image a little less, perhaps because I haven't spent so much effort on the hunt. Still, I'm grateful to be able to find so many digital images in cyberspace. But I have faith that there's much more to be discovered. The internet may be a million miles wide, but it's only an inch deep when it comes to some artists who have yet to arrive from obscurity. I agree that it can be a curse. The internet is very good at supplying frissons, but then due to the ease of finding a piece of information I don't delve into an area of study further than I could. It's why I treat the internet more as a tool to track down real, physical books which I know I can spend more time pouring through. I immediately recognized Ratcliff's "Sargent" monograph! There is still a lot of great art and many great artists that are yet obscure to the internet (and even to book publishers). And, it seems to be a trend in technology that what is initially free eventually becomes pay-per-view (see ARC website), so I'm not throwing out my embarrassingly large collection of artist monographs just yet. It all depends on what you're looking for. Last year I wrestled with myself before finally dropping $400 on a collection of Kawase Hasui's prints... absolutely worth every penny and more, but still painful to shell out. I wish they had been available cheaper. I still like combing through bookstores for surprises especially from the ones who are hold outs on the internet:-) tho they are few here. Artists and writers I'd never have have heard from other countries of I know of thanks to the internet so its nice there work has travelled farther then they imagined and more will continue to be unearthed. I discovered you through the internet, so I' thankful for THAT. Finding images online isn't a problem. Finding HIGH QUALITY images is a real struggle though when you're looking for a specific artist or piece. This is why books still have great value. I spend a lot of my free time trawling through Internet links trying to self educate and be inspired. 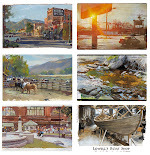 Living in the UK the art is very different, so access to the wonderful art around the World is liberating and exciting. I love your blog, a little piece of inspiration every day. I still spend a fortune on books but now I can access a Worldwide bookstore 24/7. I think we could benefit by studying the images and paintings we have access to with greater care, rather continually downloading literally hundred of images one can get with a just a few searches. Same goes for drawing books -how many of us always buy the 'hot' new drawing book, but still haven't read all the ones we have?? Hi, this is an old lurker speaking! I have been reading this blog for ages, and I love it, just as I love your books. This post made me comment, because I still remember the excitement I used to get from the art books I found in my grandmother's bedroom. I think it is there where my love for art was born. There was something deeply mystical and monumental about those faded prints of Tizian and Rubens and Monet, even though half of them were black and white. Now that I can spend hours browsing high resolution pictures on the internet, my excitement has turned into rapture. Still, there is nothing like seeing the real painting in a gallery. One of my big wishes is to go and visit all galleries that have Vermeer - that would likely push me over the edge for good. By the way, I have recently started a blog that is all about sharing love for art. If any of you who are reading this ever feels like contributing, you are very welcome, just let me know! It's here: artgush.tumblr.com. Ah, now it sounds like I am only self-promoting here. Anyway, thanks for writing this blog, Mr. Gurney, please keep going!